The cake was made in 2 layers of sponge using dowls to support the top layer and coverd in regal icing. Small squares were cut out in different colours and fixed around the base of each layer. The building blocks were small squares of sponge covered and used to form the name. 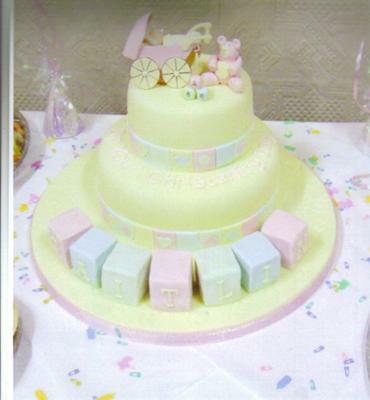 The babies pram teddy and small blocks were made from sugar paste. I hope you like it. I love the detail on your cake. It is truly beautiful!